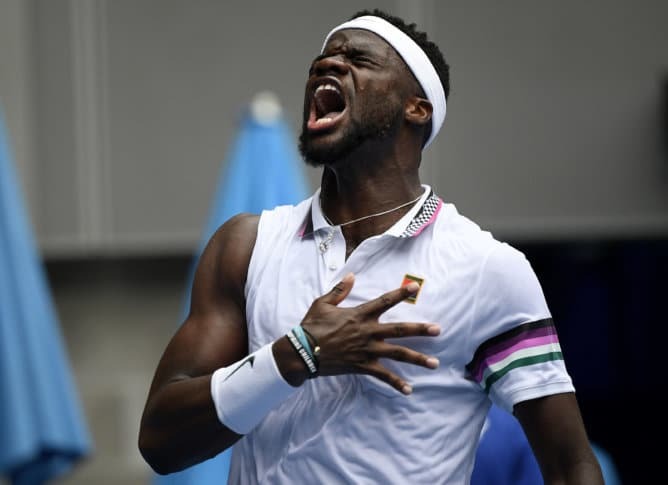 Hyattsville native Frances Tiafoe rolled up his sleeve, flexed and slapped his biceps muscle five times to celebrate the biggest victory of his career, a 4-6, 6-4, 6-4, 7-5 comeback against two-time Grand Slam finalist and No. 5 seed Kevin Anderson in the Australian Open's second round. For Tiafoe, it helped that Anderson’s best attribute, his intimidating serve, slowed down along the way because of problems with his right arm. Anderson was repeatedly visited by a trainer during changeovers and he lost pace on his first serves as the match wore on. The defending women’s champion, Caroline Wozniacki, also advanced in straight sets, beating Johanna Larsson 6-1, 6-3, and will face Maria Sharapova next. Sharapova, whose five major titles include the 2008 Australian Open, had a 6-2, 6-1 win over Rebecca Peterson in Wednesday’s last match. This story has been corrected to show that Frances Tiafoe turns 21 on Sunday, not Monday.